DETROIT, Mich. [June 4, 2017] – Gar Robinson capitalized on multiple restarts in the Trans Am Series presented by Pirelli’s 3-Dimensional Services Muscle Car Challenge at the Chevrolet Detroit Grand Prix presented by Lear to bring home the TA2 class victory and the Detroit victory for Michigan-based Robinson Racing and the No. 74. Robinson was joined on the podium by Rafa Matos, in his first Trans Am appearance, and defending champion Tony Buffomante. With the win, Gar Robinson, in the No. 74 Pura Vida Tequila/ 74 Ranch Resort Chevrolet Camaro, sealed a 29-year pursuit of the top step of the Trans Am podium in the Motor City that started with his father, George Robinson in 1988. The elder Robinson would finish 14th in that race but returned the next four years, finishing tenth, fourth, fifth and fifth. Last year Gar Robinson made his Detroit debut in TA2 but came up just a step short finishing second in the second race of the weekend. This time, a year wiser, a Robinson finally made it to the top step bringing home the win for the family’s No. 74. Robinson started the race on pole but was overtaken by Buffomante, in the No. 34 Bestline Superior Lubricants Ford Mustang, in turn one of the first lap of the race. Robinson would hold second position until the 12th lap, when he retook the lead. The TA2 race saw a total of three full-course cautions, the first of which began on lap 17 and was followed by three restarts and a mere five laps of green, including a final restart with only two laps remaining that proved critical. The Robinson Racing team had stressed a fast car over the short run in their race strategy, a move that proved pivotal. The win is Robinson’s second of the season, and third podium; it also moves the No. 74 to the top of the point standings. It also marks the seventh victory of Robinson’s career—which already includes the 2015 TA2 championship. Finishing second was Rafa Matos, in the No. 87 3-Dimensional Services Group Chevrolet Corvette, making his first TA2 appearance with the HP-Tech as Doug Peterson, a two-time TA class champion, yielded way to Matos in the pursuit of a TA2 win in 3-Dimensional’s hometown show— a move that fell just short of the top step. Still Matos, who started 12th after a shortened qualifying, consistently moved up through the field eventually overtaking Buffomante on the 27th lap for second position, a position he would hold for the duration of the race. Buffomante would finish third, his second podium of the year in three appearances—keeping the No. 34 well within contention as his title defense continues. The Mike Cope Racing Enterprises team worked relentlessly on setup throughout the weekend progressively finding speed, culminating in a P2 start and a spot on the podium—that speed was also evident under green conditions, with the No. 34 turning the fast lap of the race, a track record, 1:36.203. Finishing a career best fourth place was Sheldon Creed, in the No. 12 Stevens Miller Racing Dodge Challenger, in only his second TA2 appearance. The weekend was a successful one for Creed who also captured two wins in SPEED Energy Stadium SUPER Trucks, also in attendance at the Chevrolet Detroit Grand Prix presented by Lear. Keith Prociuk, also hailing out of the Mike Cope paddock in the No. 9 HP Tuners Chevrolet Camaro, would finish fifth— tying his career best finish. The TA2 top ten also included Tom Sheehan, Matt Parent, Ray Neveau, Lawrence Loshak and Cameron Lawrence. The Robinson Racing team was awarded the Pitboxes.com Crew of the Weekend for their efforts in preparing the No. 74 and No. 72 Robinson Racing Chevrolet Camaros, while Jim Fraser was named the TraqGear Crew Chief of the Race for his race-winning strategy. For moving up a total of 11 positions over the course of the race, Rafa Matos was presented the COOLSHIRT Systems Cool Move of the Race award. Exiting the event Gar Robinson takes the TA2 points lead with 121 points, followed by Dillon Machavern with 100, Shane Lewis with 94, Tony Buffomante with 84 and Cameron Lawrence and Lawrence Loshak with 77 points each. 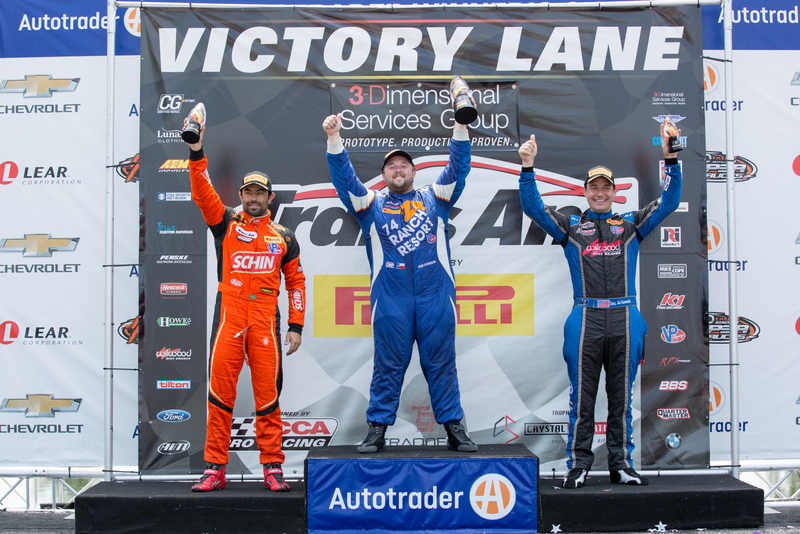 Trans Am’s TA class held a separate race, the 3-Dimensional Services Motor City 100, on Saturday, June 3, where Ernie Francis, Jr., was victorious, while Vinne Allegretta finished second and Simon Gregg third. A full recap of that competition can be found at gotransam.com. The Trans Am Series presented by Pirelli, and the TA2 class, will now head to Indianapolis Motor Speedway for Round 5 of the 2017 Trans Am Championship, June 17-18. The Trans Am Series presented by Pirelli was joined by the Verizon IndyCar Series, the IMSA WeatherTech SportsCar Championship and the SPEED Energy Stadium SUPER Trucks for one of the great weekends in motorsport, the Chevrolet Detroit Grand Prix presented by Lear. All results provisional until posted final. Broadcast: This weekend's event will be broadcast, tape delayed, on CBS Sports Network.